Dehydrating celery at home in an oven or dehydrator is an easy process that requires about 10 minutes active time and 6 to 8 hours inactive time. Celery is an essential ingredient of soup stocks and of the mirepoix blend of celery, carrot, and onion that is the backbone of so many savory dishes. If you dry celery, you will always have it on hand for recipes. When you only need a stalk or two and don't have any fresh celery on hand, dried celery will usually work fine. The only thing you can't do with dried celery is use it the way you would raw celery. Dehydrated celery won't work for most salads or crudités, but it's perfect for any cooked dish that needs celery flavor. Blanching is essential before dehydrating celery. Unblanched celery dries to an unappetizing tan color. 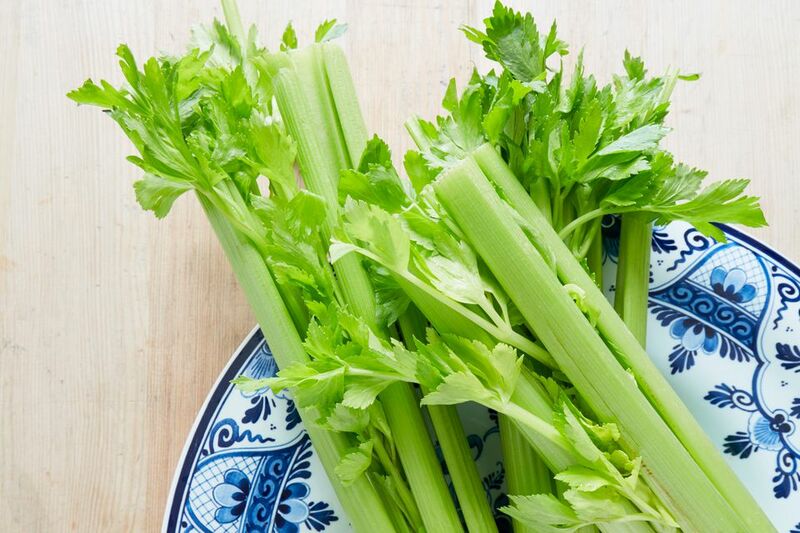 Blanched celery keeps its emerald green color when dried. While it is heating, wash the celery. Cut off the whitish bottom ends and the leafy top ends. Save the ends and leaves for soup stock by freezing them. If you keep adding them to a container in the freezer, you will never have to buy celery just to make stock. Cut the celery stalks into thirds. Dump them into the boiling water, and leave for 1 minute. Drain them, and immediately run them under cold water or immerse in ice water to stop the residual heat from continuing to cook the celery. Slice the blanched celery into 1/2-inch-thick crescents. At this point, you can stop and store the blanched, sliced celery in the refrigerator for up to 24 hours before proceeding with the dehydration. Arrange the celery pieces on the trays of a dehydrator, leaving 1/4-inch space on all sides between the pieces. If you are using an oven rather than a dehydrator, arrange the pieces on a screen placed over a baking rack. Dry at 135 F until the celery is crispy-dry. This usually takes 6 to 8 hours. If you are using an oven that doesn't have a temperature setting below 150 F (many don't), set it to the lowest heat, and prop the oven door open with a dish towel or wooden spoon. Note that this wastes a lot of energy. If you are planning to dry a lot of food, a dehydrator is a worthwhile investment both financially and environmentally. When the celery is crispy-dry (usually takes 6 to 8 hours), remove the trays or baking sheet(s), and let them cool at room temperature for 10 minutes. Transfer the dried celery to glass jars, and screw on the lids. Label the jars with the contents and the date that you dehydrated the celery. Store away from direct light or heat.